Here’s what’s happening in the world of television for Friday, April 5 and Saturday, April 6. All times are Eastern. 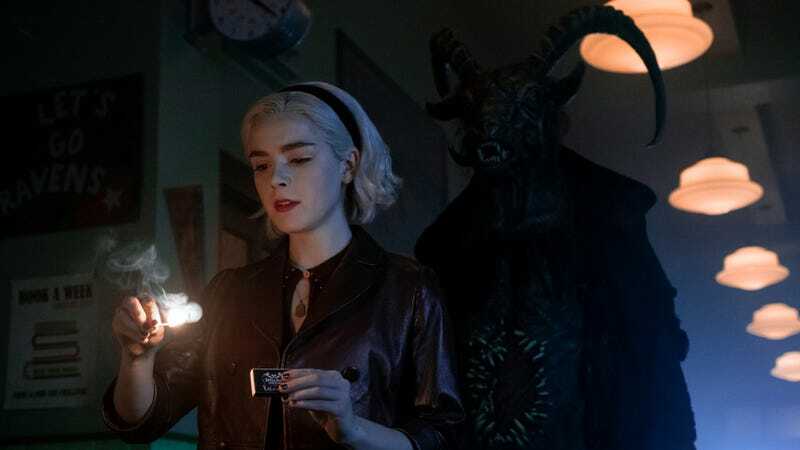 Chilling Adventures Of Sabrina (Netflix, Friday): Praise Satan! Part two of Sabrina’s chilling adventures has arrived, and from the looks of it, season one’s second half will be even darker and bloodier than its first. Sabrina’s embracing her edgier side, which apparently involves arson, snapping necks, and entering into a love triangle. As ever, it looks like wicked fun. Lisa Weidenfeld will have binge recaps throughout the weekend. Crazy Ex-Girlfriend and Yes, It’s Really Us Singing: The Crazy Ex-Girlfriend Concert Special! (The CW, Friday, 8 p.m.): Speaking of love triangles—or, rather, love quadrangles—Rebecca has some choices of her own to make. Between Rebecca’s complicated love life and search for a new passion, CXG has a lot to wrap up in the series’ final episode. But that’s to be expected. If you saw a show that was like real life, you’d be like, “What the hell was that show about? It was really all over the place.” As Josh Groban can tell you, life doesn’t make narrative sense. Allison Shoemaker is here to make sense of the end of this crazy-good series. Also, a friendly reminder that the finale is set to begin an hour earlier than usual. That’s to make room for the live concert special to follow, in which the show’s cast (and hopefully old Greg?) will perform all your favorite songs from the show! The Tick (Prime Video, Friday): In a market oversaturated with superhero entertainment, this oddball series became a surprisingly welcome bright spot. Today, the goofy, warm-hearted series returns with 10 new episodes. When we last left Arthur and The Tick, they’d been alerted to the presence of “Big Brother.” This season brings a new wave of heroes, and with it a “spree-vil” for The Tick and friends to tackle using teamwork and warm hugs. John Hugar has the review. Our Planet (Netflix, Friday): From the people who gifted us with Planet Earth comes yet another soothing, awe-inspiring nature docuseries narrated once more by David Attenborough. And if eight hours of Attenborough saying the word “sloth” isn’t enough to convince you to tune in, this latest installment has added stakes: The footage not only highlights the world’s natural wonders, but documents the ways in which climate change is affecting them, showing that while our planet is a spectacularly beautiful one, it might not look this way for long.